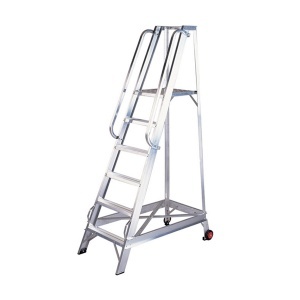 This high quality, fixed Aluminium warehouse step ladder is designed to create an ultra stable platform for users to gain access to higher levels of shelving and racking. Made by Pinnacle Ladders from heavy duty channel-section material with double riveting throughout you get a rigid structure to use the steps with absolute confidence at height. Because of the fixed frame design, this pair of steps is best suited to warehouse and factory use where there is enough room to leave the step ladder in place whilst you work around it. When it comes to moving the ladder around your workplace, all you have to do is grab the lower front handles and tilt the steps back on to the attached rear wheels. With the warehouse steps balancing on its wheels, you can easily move even the largest version of these steps to a new location without needing the help of another person. A large platform area is provided on the professional Aluminium platform steps along with double handrails to help the user retain good points of contact for extra safety. Choose from 6 sizes to suit your intended application. Note: Requires assembly before use. *No of treads includes top platform.